In a statement early Monday morning, Virginia Lt. Gov. 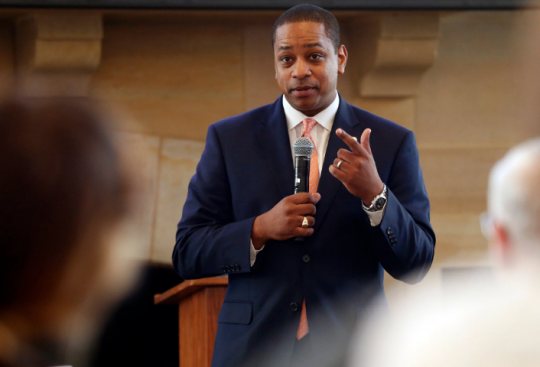 Justin Fairfax (D., Va.) strongly denied an allegation he sexually assaulted a woman in 2004. Fairfax is poised to become Virginia's next governor if Gov. Ralph Northam (D., Va.) resigns. After what was a disastrous week for Northam, numerous Democratic lawmakers and groups have called for him to step down and give way to Fairfax. In the story late Sunday night, Big League Politics reported an allegation that Fairfax, then a John Kerry staffer, assaulted a woman at the 2004 Democratic National Convention. The Washington Free Beacon could not verify the allegation. Fairfax, at 3 a.m. Monday, tweeted a strong denial. He said he "has never assaulted anyone … in any way, shape, or form." Though he did not name Big League Politics by name, Fairfax's description of the allegation matches the report. Fairfax threatened legal action, calling the story "part of the sad and dark politics" he vowed to oppose. He said the Washington Post previously investigated the allegation and declined to publish it because of "facts consistent with the Lt. Governor's denial of the allegation, the absence of any evidence corroborating the allegations, and significant red flags and inconsistencies within the allegation." Northam first came under fire last week after a radio appearance in which he defended the right of a mother and physician to choose for a newborn to die. Then on Friday, one of his medical school classmates shared a copy of Northam's yearbook page. It featured a picture of one man costumed in blackface and another in a Klansman's hood. The photograph prompted a cascade of Democrats and Republicans to call for his resignation. Former Virginia Gov. Douglas Wilder (D.), the nation's first black governor, was among those who called for Northam to resign. Should Northam and Fairfax both step down, Virginia Attorney General Mark Herring (D.) would become governor. Correction 12:41 p.m.: An earlier version stated that the president pro tempore of the senate would become governor if Northam and Fairfax should resign. That was incorrect and post has been updated.